If you enjoy gardening, then you will probably already know just how much of a nuisance cleaning up all of your equipment can be. Garden hoses in particular can quickly begin to crack and split when they are not stored away properly, which is why a garden hose reel is a vital part of any gardener’s inventory. Today we are going to be taking a look at a few different products in order to work out which really is the best garden hose reel. There are a few different factors that we need to consider, including material, length and storage space in order to do this. We understand just how difficult choosing the right garden hose reel can be. There are a lot of different options out there, ranging from a sturdy wall mounted garden hose reel to a handy retractable garden hose reel. We have put together this section to help you work out which option might be best one for you. As we have already mentioned, choosing the right garden hose reel to suit your needs can be difficult and you need to make sure that you are choosing the right one for your garden. With a garden hose reel, your actual hose will last a lot longer than it otherwise would because it will not be exposed to any adverse weather conditions. You will also be more likely to use your hose because you won’t have to worry about winding it up on your own after every single use. One of the main things that you have to consider when you are looking for the right hose reel is how long your actual hose is (if you already have one). What are you going to do if you can’t fit your hose on the reel? Purchasing a garden hose reel that is too small is a frequent occurrence so you should always try to size up. Remember that your hose will also expand and contract as temperatures change and you have to prepare for that. Another thing that you have to consider is whether or not you need your hose reel to be portable. Not everyone does and only you will be able to decide whether or not you do. 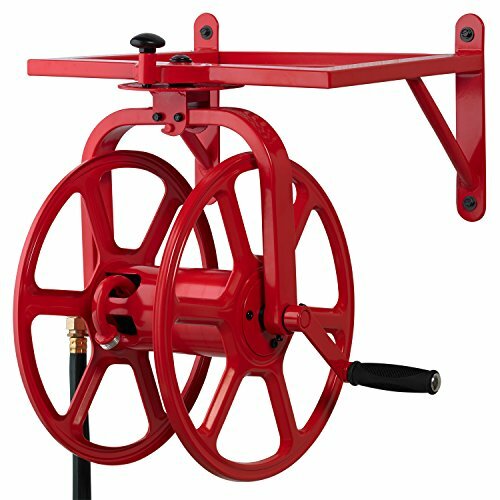 If you have a really large garden, choosing a hose reel that is portable is something that you will probably benefit from. If you do go with a wall-mounted hose reel, then you will just need to make sure that your hose is long enough to reach the far sides of your garden. What are the Advantages of Owning a Garden Hose Reel? In our opinion, one of the main advantages that comes with owning a garden hose reel is simply practicality. Owning a hose reel is useful because it means that your reel does a lot of the work that you would otherwise have to do. You are simply the operator. Owning a garden hose reel is also advantageous in other ways. For example, a garden hose reel is useful because it can be an important safety feature. Have you ever seen someone trip over a hose that has been left out in the yard? A lot of hoses are green so that they blend in so it is actually incredibly easy to trip over them, especially if they have been used and they are made of rubber, because then they are also slippery. A hose that is kept on a hose reel will also last longer. Your hose will not be exposed to general wear and tear while it is not in use and if your hose reel is a retractable one, then your hose will be unlikely to become twisted and knotted to the point where it becomes damaged. Storing your hose neatly and properly increases the overall longevity of your hose. Some reels also feature a protective casing that sits around the hose so that it is not exposed to any adverse conditions. Having this protective case around the hose can also stop things like UV rays, frost and other potentially harmful conditions from damaging your hose. If you are using a sheltered hose reel, then you should expect your hose to last up to 5x longer than it otherwise would. We all like to pretend that aesthetic appeal isn’t important when we are purchasing things for our garden, but we also all know that it is. Garden hose reels come in a variety of different shapes and sizes. We would always recommend that you choose functionality over looks, but we also know how important it is for your hose reel to fit in in your garden. You get to choose whether you would prefer a classic look or a rather contemporary and modern design. 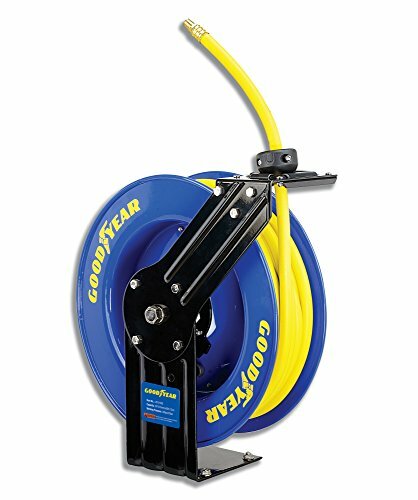 The Goodyear Retractable Water Hose Reel is a product that has to be mounted onto the wall, meaning that it wouldn’t be suitable for people who want a hose reel that they can move around with them. This particular model also doubles as an air compressor and comes with a rubber hose. This means that you don’t have to worry about whether or not your own hose will fit inside of it. 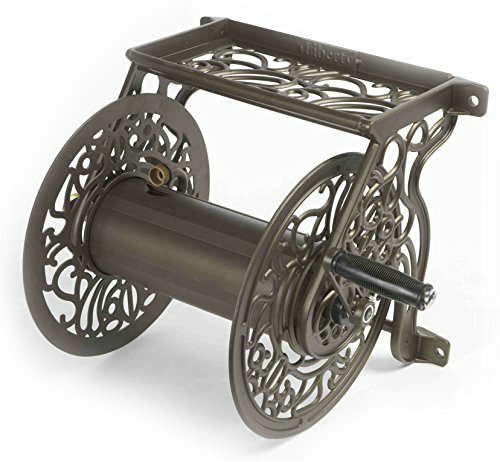 This reel fits on a single-axel and has been made out of a powder-coated, ribbed steel. This has made it incredibly durable and weather resistant, making it a great option for use outdoors. One factor that you need to consider when you are choosing a hose reel is whether or not it is corrosion resistant, and this Goodyear product is. This garden hose reel is highly functional and acts as a self-winding garden hose reel, this ensures that no kinks occur while the hose is being retracted back onto the reel. The enclosed spring function inside of this hose reel locks the hose at a specific length, but you can choose not to use this function if you would prefer to wind by hand. One thing that you need to consider whenever you are looking at a mountable hose reel is whether or not it is easy to mount. This particular model is, as long as you are securing it somewhere low down. If you mount it properly, then it will be really sturdy. If you are planning on mounting this reel quite high, then you might have a problem with this particular model. You would essentially have to hold it up and bolt it to the wall at the same time, meaning that you will need to have a second pair of hands around in order to do it. As we have already mentioned, aesthetic appeal is something that you might want to consider. Luckily, the Suncast Wicker Hideaway Hose Reel has been designed with aesthetic appeal in mind. A lot of people actually make the mistake of believing that this cannot be achieved with outside equipment and we are more than happy to show you that this garden hose reel can. This hose reel comes with a contemporary wicker design that conceals both the hose and the reel. It can be fully-assembled with no tools and it is large enough to store really long hoses. This product comes with a Smart Track system that can be used to ensure that the hose is evenly rolled whenever it is retracted. 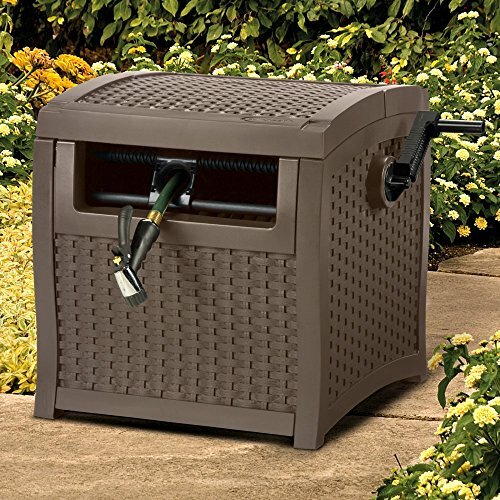 The Suncast Wicker Hideaway Hose Reel comes fully assembled so that you don’t have to worry about anything. This means that you can start using it straight away without having to mess around with tools or construction. One of the only problems that we have noticed with this hose reel is that the spool is plastic. This means that it could quite easily become non-functional if you overload it with an incredibly long hose. The Liberty Garden Aluminum Hose Reel is a decorative hose reel that has a powdered coating finish, meaning that it looks quite attractive, in addition to being durable. The fittings are brass and galvanized, and the spool itself is capable of holding a 125 ft. hose. If you were to choose this product, then you would benefit from it coming fully assembled and ready to use. You simply attach the handle and then mount it to a wall. Remember that a wall-mounted hose reel will only work for you if you are not interested in carrying your hose reel around the garden. We believe that the best thing about this hose reel is the fact that it comes pre-assembled. Being able to use a product straight away is a lot nicer than waiting around and struggling to fit it together. This garden hose reel also comes with a handy storage shelf that you could put all of your replacement parts on. The aesthetically appealing side of this product is wonderful because the design itself would fit in in most gardens. The design has also been matched by an impressive level of durability because it has been crafted using rust-proof materials. This hose reel does not come with all of the fittings that you need to fit it properly. This is a little bit problematic because you are unlikely to have them lying around your house unless you know that you need them. The Liberty Garden Revolution Multi-Directional Hose Reel is a rather unique product because it actually features a 360° rotating design, something that is rarely found on hose reel designs. This design makes it much easier to do everything that you want to do and it means that the reel sits below a storage shelf, as opposed to simply sticking out of the wall. You could use this shelf as a home for all of your nozzles and accessories. This hose reel has been crafted out of steel and the steel itself has been powder-coated to prevent some of the corrosion that gardeners will be used to seeing on their metal products thanks to adverse weather conditions. It could potentially be used to hold a hose of up to 150 ft. long and it features 24 different locking positions that can be used for your own convenience. One of our favorite things about this product is the fact that it is incredibly easy to install and use out of the box; it barely requires any assembly. All that you would have to do would be to attach the handle. Convenience is a key feature in the way that this hose reel has been manufactured. The rotating feature means that you can point it in any direction and a large knob can be used to lock it in place. It is worth noting that it does not come with any additional mounting hardware, meaning that you would have to find both the right screws and something to attach it to. This could be problematic if you are planning on mounting it as soon as you receive it. 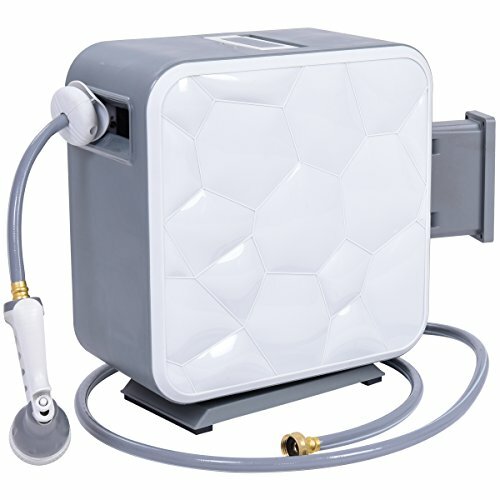 At first glance, the Goplus Retractable Garden Hose Reel looks more like a PVC box than a hose reel, with a cute bubble design on the side that you wouldn’t usually associate with standard hose reels. It is cubic in shape and it can be mounted to either the ground or a wall, depending on your own personal preference. It is worth noting that you will only be able to achieve a 180° rotation if you mount it to the wall, opposed to the 360° rotation that you would get from mounting it to the ground. This hose reel is a good option for people who like to keep themselves and other people safe because it has been designed with slow retraction in mind; it will not pull your hose back in at full speed. It also features a locking mechanism that allows you to lock the hose at a desired length. If you mount this hose reel on the ground, then you will benefit a lot from the 360° rotation that it will offer you. It can be mounted to the ground with four metal hooks. This product comes with a 9 pattern nozzle, meaning that you will have plenty of different options for completing any tasks that you may have to complete in your garden. It is worth noting the fact that the housing around this hose reel is made out of PVC. PVC is probably not going to be as durable as some of the other alternatives that are available if you shop around. It might also stand out in your garden in a way that you don’t like. In our opinion, the Eley Rapid Reel Garden Hose Reel is a perfect option for most gardeners. Users have rated it highly across the board and it features a perfect balance of both quality and functionality. It has been crafted out of robust materials that can stand up against some of the adverse hot and cold weather conditions that can be found in gardens and other outdoor environments and the price that it retails at is justifiable because of this.